I am a firm believer that superb photography is key to listing any property. At times, when still photography doesn’t quite convey the home’s unique qualities and beautiful location, I find it necessary to create high-quality videos that capture the essence of the home. 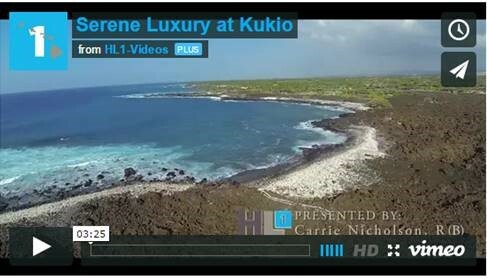 I am pleased to share with you this superb new video for my new listing, Kukio Phase 3, South 7. As you will see, the video provides a glimpse of the Hawaii Life Kukio has to offer. Swaying palm trees and spectacular ocean views set the serene setting and are just a few features this well-appointed home has to offer. A 4,200 sq.ft. custom home with an open floor plan designed for exceptional indoor-outdoor living has exquisite custom finishes throughout. The home is strategically positioned on a 0.54-acre lot to maximize the ocean and sunset views from the interior living space, lanai, and master bedroom.